If you ask a food writer who is worth her(his) salt what “authentic” Italian food really is, she will tell you that “authentic” in food does not exists. However, millions of people visit Italy every year not only for its many cultural treasures but to experience the true, original Italian cuisine. So often I have heard sentences like “pasta is so much better here” or “I have never tasted such a delicious pizza/coffee/gelato as in Italy”. But what is authentic? Is it traditional? Food and cooking methods evolve with time and in fact, the quality of our food is now very different from what was available in the past. Besides, Italian food has endless regional variations and it’s influenced by personal preferences and needs. But why do I – and I am sure many of my countrymen – get so annoyed if some TV star makes pasta with vermouth and calls it a carbonara? or makes ravioli with wonton wrappers and cooks them for 4 interminable minutes? Why do I get the hives at the mere mention of bacon and pineapple pizza? I am not against culinary freedom, innovation and experimentation. But traditional recipes demand some respect or a change of name. Isn’t it too easy to use the name of a famous dish while making something which has hardly anything to do with its original ingredients and cultural context? Call it egg pasta with vermouth and see if it sells! Take the humblest of Central Italian salads, the panzanella. Once it has made it in the Food Network every Tom and Jerry has “created” his own version “for an added dimension and some crunch”. It is obvious: a recipe that has been made in the same way for at least 100 year needs to be perfected. Therefore they will liven it up peppers, corn, provolone, green beans, olives, mozzarella, oregano, capers, Parmigiano, mustard, fennel, tuna fish and why not? a piece of sausage. Fine, I say, excellent, but what you get it’s not a panzanella, it’s not a nicoise, it’s not a caprese, it’s not a Waldorf salad. What you will get is your general salad, the one you make with the leftovers from the fridge. So if you want an “authentic” panzanella, one that you’d eat on a terrace in the country home of your dreams, one that has the flavor of a warm Italian summer night, please make it like we do in central Italy, with few ingredients and a glug of really good olive oil. My Umbrian grandmother soaked the bread in white vinegar and water until it was really soft. I prefer balsamic vinegar because it’s sweeter and I add the bread at the end for that “added crunch”. You see, interpretation is totally legal if you take the right precautions 🙂 . A half an hour before serving the salad, drain the diced onions from the water. Combine with all the other salad ingredients in a large serving plate. Let it sit to combine the flavors. Toast the bread slices until golden and crispy. Rub with the garlic clove and dice or tear into 2 cm (about 1/2 inch) pieces. Scatter the bread and basil over the salad and drizzle with olive oil and vinegar. Serves 8 to 10 as a side dish, appetizer or vegetarian main. PS. my cookbook “A Kitchen with a View” is now available on Amazon, both in USA and Europe . If you have a copy or plan to buy one, I would so appreciate if you would write me a review to kickstart the sales, thank you! Hi Di and Fiona, how lovely to know you like the book! I cross my fingers for your return in a not too distant future! as explained in the blog post if it has corn or smoked bacon is not a panzanella! You can use stale bread indeed and soak it in water or water and vinegar. This way you have the soft version of the panzanella. I use toasted bread as explained in the recipe because I like it a little bit crunchy, it’s up to you! PS – I imagine Gwen will be back… I have had the same problem in trusting someone. I made ravioli with wonton skins and to say that it was wrong is an understatement. PPS – I need to check out your book! Sorry I have not done that yet! David, Gwen has returdned and we made real ravioli! Now, if American “celebrity” chefs and routine restaurant chefs and chain restaurant chefs would just learn that adding heaps and heaps of garlic to traditional recipes that call for little or none, Americans might discover there are wonderful subtle flavors in those dishes. The garlic fad has made all cookery in America taste the same, no matter what tradition or ethnicity it pretends to represent. By this gimcrackery they have ruined even their own country’s greatest regional culinary traditions. And I neglected to say, I can’t wait to try this refreshing seasonal dish. We are at the peak of tomato and basil season, as well as the peak of hot weather when such dishes are particularly alluring! peak tomato season is paradise for me, I can never have enough! 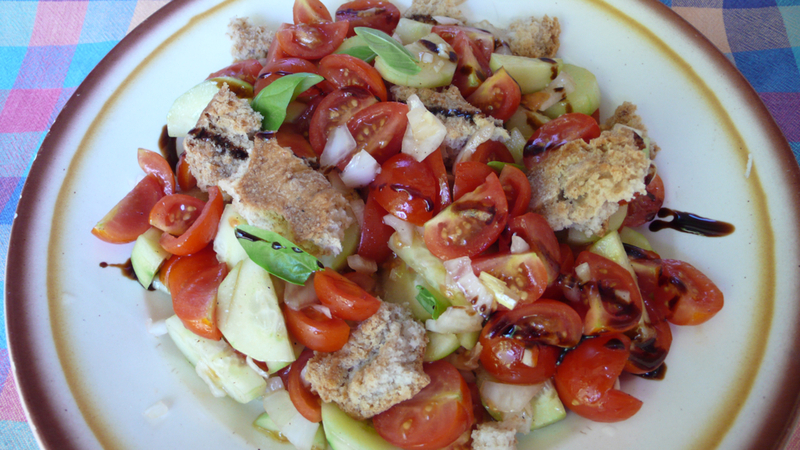 Enjoy the panzanella! I am so delighted to have found your blog — your recipes all look so delicious, and I’m excited to prepare them! I am also looking forward to ordering your new cookbook! ciao Anna, lovely to meet you! I hope you can make good use of the recipes! I stopped watching the Food Network years ago. It gives me heartburn…! because I ‘m in Italy, I have had the privilege of missing lots of shallow cooking programs, good for my nerves!